Pakistan Computer Association (PCA) has decided to organize an extensive training programme in order to provide a unique opportunity to IT professionals and computer vendors for learning and understanding the Open Source Operating Systems (OSOS) from August 17, said a statement issued by PCA. The stakeholders would be given detailed orientation sessions about these operating system, which would be available almost free of cost to the stakeholders, ending monopoly of expensive software in the country (Microsoft Windows), said the statement. This would be first of its kind of training program where IT experts and other stakeholders would be provided an opportunity to learn about low cost operating system helpful in Pakistan business environment and working conditions of local corporate culture. PCA will not charge any cost of the training, but would provide maximum literature, data and training advice from national and international experts in order to learn about the OSOS. The training would help the IT professionals to learn how to operate state-of-the-art software technology and launch the same in Pakistan effectively and the affordable new IT new technology would be available to all users in Pakistan besides protecting and ensuring following the Intellectual Property Rights (IPRs) Regulations. Pakistan Computer Association (PCA) has taken special initiative of providing training opportunity in Open Source Operating Systems to the stakeholders of the industry throughout Pakistan, whose trend is rapidly growing and getting popular in Europe and rest of the world. 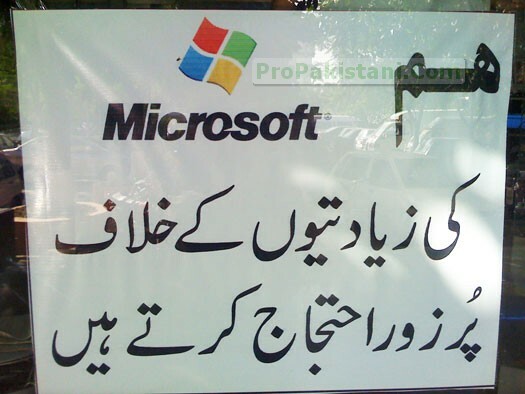 It merits mentioning here that Microsoft, with help of FIA had been raiding computer shops for selling pirated copies of Windows. How can i attend this training??? How can i attend this training? I hope Linux spreads in Pakistan. The free, no viruses, powerful, free help and support, free updates and upgrades Operating system. Microsoft= Slow, non free, always viruses and many other disadvantages. LinuxMint – may helpful for XP/Vista users. Was too much buggy in past, but much better now. I am using it since 2 years after RHEL. I have no problem with it. You can play almost all audio/video extension, Openoffice is available there. The great thing is you can carry it through out world with out any headache of license fear. Can you tell me how can i run windows application like Adobe Photoshop, dreamweaver and other applications like that..
You can use “Wine” for Windows Applications. Although there is alternative for Adobe Photoshop called ” GIMP “. Depends on, what is your requirements? Linux is good for you – go ahead! Vlc,Mplayer,Xine and more can play almost all video/audio extensions. Firefox,Opera,Evolution are the common browser for web surfing. Chrome is on way, soon to launch its linux version. Here, LinuxMint is recommended, Ubuntu is also not bad, only interface problem and has user friendly installer. yar us main msn nd yahoo msnger waghaira tou ho jatay hain na??? Usman – try consulting some friend, or forums. We may not respond to all of your questions here (in comments). Yes, yahoo, msn everything works there! You can use, Pidgin it supports all protocols. There is Yahoo official messenger of linux, but its very classic may be ugly User interface for you. Go and read about both features on their official sites. I use LinuxMint at home, while Ubuntu at office. brothere..what is the difference between Ubunto and linux mint. whih one is better and are there any hardware compatibilites or does it work with any kind of hardware …. Find the list of laptops,hardwares supported. I use it on Dell laptop and IBM Workstation, it rocks. Dear we have to attend the training. this is a great opportunity to familiar with Linux environment.